Hope you guys are well? I am nursing a bit of a cold since Saturday so I haven’t been very active or upbeat in the last few days. I spent most of my time staying on the sofa with my cat, watching Netflix and drinking buckets of herbal tea. Duncan is in the same boat, sadly, but because his symptoms are a bit more acute so he has spent lots of that time sleeping and watching Vikings, which I am not that into anymore. We are both frustrated with not being able to go for a run, especially that yesterday was a gloriously sunny day, but hey, I am sure there will be more of those soon, right? We’ve also been hoping for some quality time together this past weekend as it’s been all work and no play lately, but it looks like that needs a reschedule. So in the recipe department, I went for easy, nourishing food that my body craves right now. 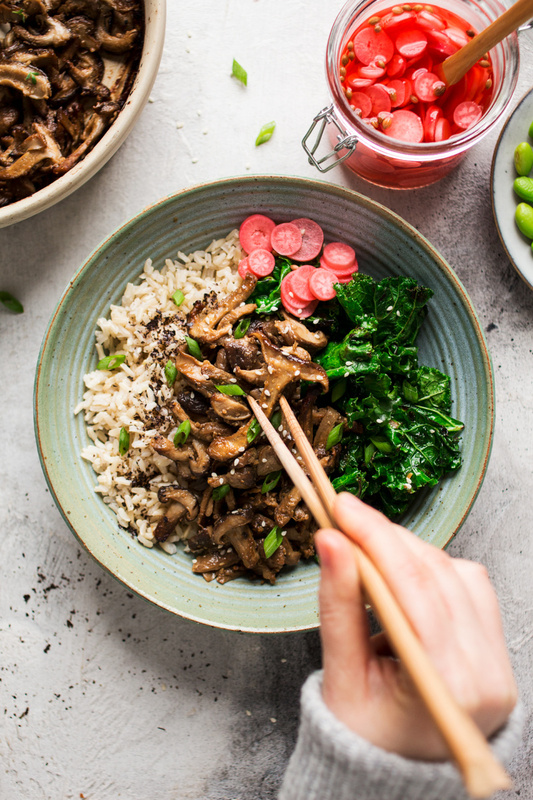 It’s a bowl full of goodness – brown rice and stir-fried kale topped with addictive miso shiitake, which are delicious and if you are a mushroom lover, like me, it’s hard not to simply eat them all straight off the baking tray. I made some quick-pickled radishes to go with this, but if that’s too much work, simply serve it with finely shredded sushi ginger or some shop-bought pickles. A portion of kimchi would also not be out of place here. 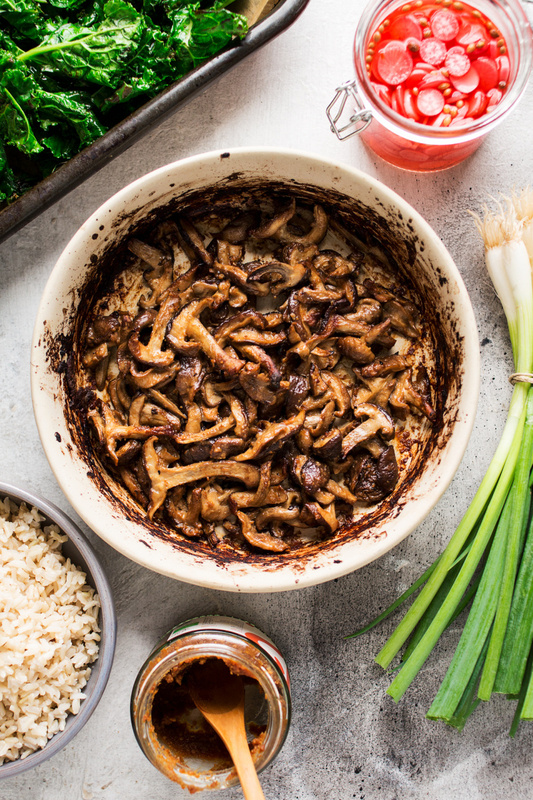 PS: If you make my miso mushroom bowl don’t forget to tag me on Instagram as @lazycatkitchen and use the #lazycatkitchen hashtag. I love seeing your takes on my recipes! Put vinegar, 60 ml / ¼ cup of water, salt and sugar in a small pot and bring everything to a gentle simmer. Place sliced radishes in a clean jar together with ginger (if using) and pour hot brine on top. Set aside for 30 minutes before using. Keep in a sealed jar in the fridge for 2 weeks. Preheat the oven to 200° C / 390° F and brush a medium baking dish with oil. 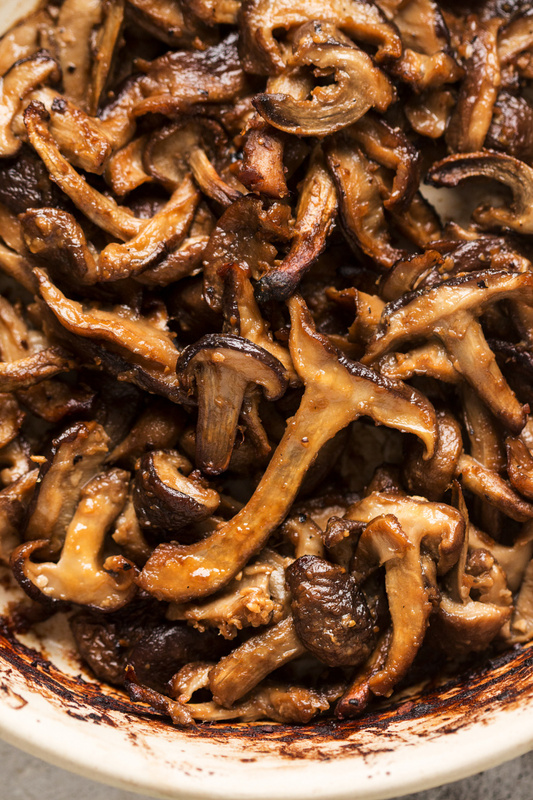 Clean the mushrooms and slice them into thick slices (leaving any tiny shiitake whole). In a mixing bowl combine miso paste, rice vinegar, mirin (or maple syrup), toasted sesame oil, 2 tsp of vegetable oil and the garlic clove. You could also make 50% more of the marinade and use the rest as dressing after diluting with a little water. Stir 2/3 of the mixture through the mushrooms and place in the prepared baking dish. Bake the mushrooms for 15 minutes and then stir them, adding the rest of the marinade. Bake for another 10 minutes or so. After 10 minutes, change the oven’s function to grill / broiler and move the mushrooms closer to the top of the oven. Grill for another 5-10 minutes until caramelised in places. 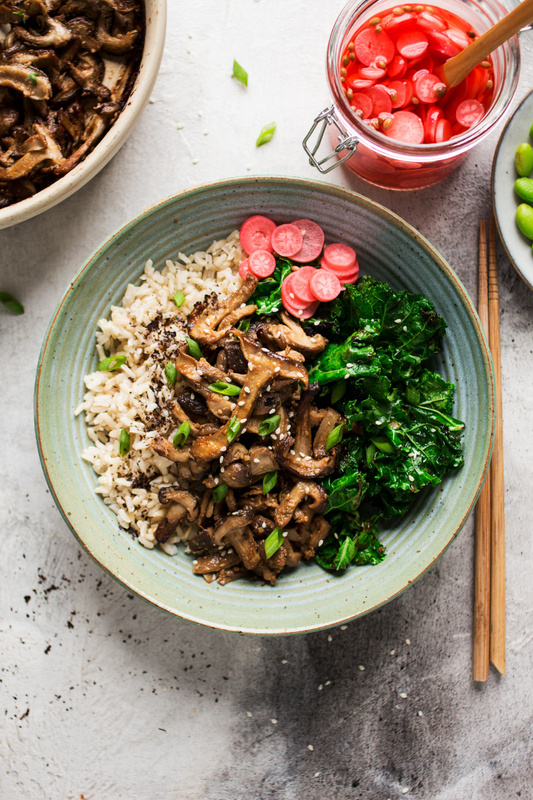 Divide the rice, greens and miso mushrooms between two bowls. Sprinkle with sliced spring onion and sesame seeds, serve with pickles on the side. If needed, season with a splash or tamari / soy sauce. *Button and chestnut / cremini will work well too. They have a bit more moisture so it may take 5 minutes longer for them to caramelise in the oven. **Make sure you use gluten-free miso for gluten-free version of this meal. There are miso pastes based on chickpeas, rice, quinoa that do not contain gluten. My recipe is adapted from this recipe.